Last night I made a $5,000 mistake. I disassembled this butterfly valve a month ago for cleaning. Apparently when I put it back together I alligned the indicator perpendicular to the flap when it should have been parallel. Do you know what happens next??? I turn on the vacuum pump. The turbopump goes to full speed. Now the butterfly valve is actually closed. Which means the vacuum can’t get to the chamber. Which means the chamber is at atmospheric pressure. Then I turn the butterfly valve…. Apmospheric air slams into the full speed turbopump, and it makes a bad sound. When I opened the valve I instantly knew what was happening, but it was too late. I can’t believe I broke the pump AGAIN. Really heartbreaking, especially because I knew to avoid this specific condition. I’ll be traveling in december. 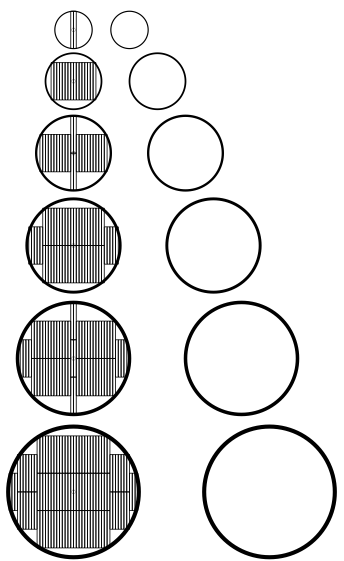 This diagram shows the possible coil configurations of the superconducting tape. Going from minor radius 2 mm at top to minor radius 7 mm at bottom. I used the very cool XRVG to generate SVG diagrams from ruby. The has been a major uphill battle… but I’ve finally installed the coil formers. This was really challenging and I fumbled every step of the way. Two reason for the difference with yours could possibly be the following: we operate in hydrogen and we work below 10 mTorr. We have a large chamber which helps in breakdown at lower pressure. Since your chamber is smaller, you may need to operate at a higher pressure but this will reduce the depth of the virtual cathode that can be established. You may be able to reduce the pressure by using electron emission from a light bulb tungsten filament. You’ll need to extract the electrons from the filament by applying a potential difference between the filament and, say, a wire mesh as the anode. The electrons will go through the anode and produce enough ionization to enable you to start the discharge at lower pressure. The lower pressure also produces deeper virtual cathodes within the polywell. 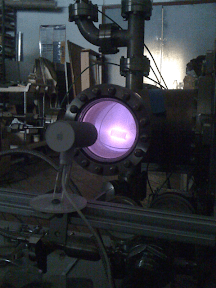 Perhaps we could run this experiment with NO gas… only electrons from a hot cathode? See Vacuum Arc. Yes, just using an electron gun would be the better way to do this. We are making electrons guns based on a hot filament in order to do this. It is possible to get quite a large current from a filament of about an amp. A gun is needed in order to direct the electrons into the polywell because it is made of teflon. Bussard did it with filaments and used the voltage bias on WB6 to draw the electrons into it, so the WB6 is part of the electron gun. And indeed I think this is the approach I’ll take.